So, being not-so-productive in the student lives we lead, we have decided instead to focus on something truly important... experimenting with as many different nail art styles and colours as possible! And what better way to properly break in the nail art pens than to take on the mammoth challenge of 31 different nail art styles in 31 days? And finally, Day 31 - re-create your favourite challenge! To start off with, here are the first 8 days. Apologies for the quality of the first 6 photos! Simple, and a good way to ease yourself into the challenge - it only gets tougher from here! 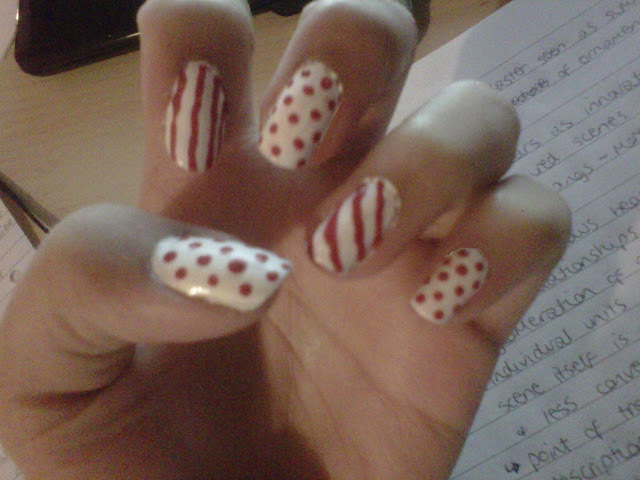 All you need is a white nail varnish and a red nail art pen, and the rest is self-explanatory! 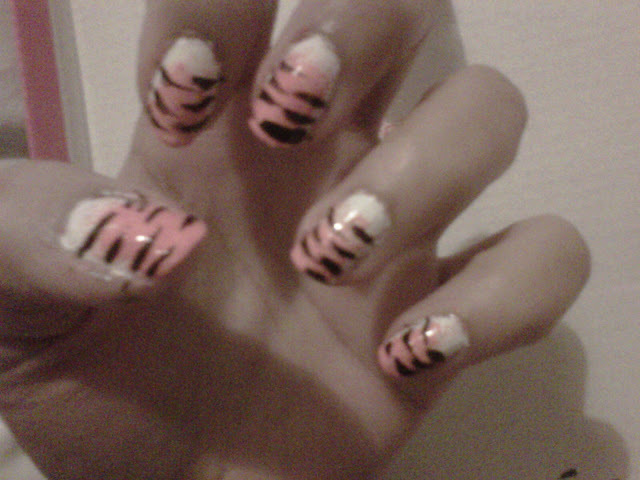 Deciding to take it up a notch now with tiger print! You need: white nail varnish, orange nail varnish, a black nail art pen and a small piece of sponge. Easy peasy really! Paint a white base coat, then, using the sponge, dab orange varnish over most of your nail, then finish with black stripes coming from either side! Easy Tiger! BANANARAMA! Though they may not look like it, these are in fact bananas on a blue background. For this one you'll need a contrasting base coat, a black nail art pen, and if you're feeling particularly arty, TWO different shades of yellow nail art pens. 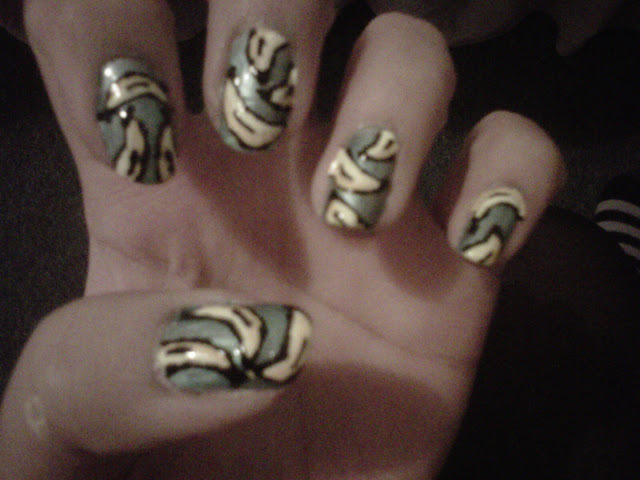 After you have your base coat down and dry, paint semicircles of the darker yellow. The next step is the paler yellow, to highlight. Then finally, there's the banana outline and hey presto, you're done! Two different shades of green, simples. It was a particularly sunny day, so decided to match the weather! 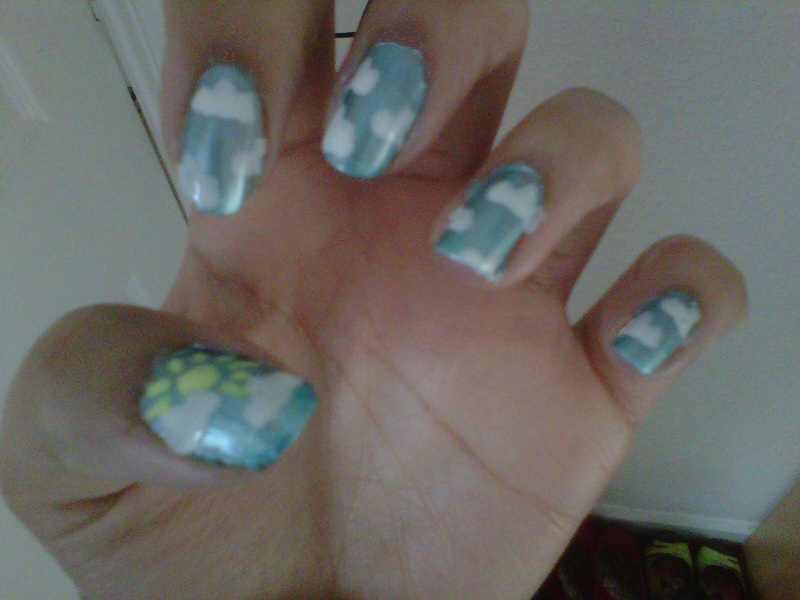 Paint yourself a blue sky base coat, and then add white fluffy clouds with a white nail art pen! And if you're feeling particularly sunny, add yourself some small rays of sunshine on the thumb! You need a fairly steady hand for this one! 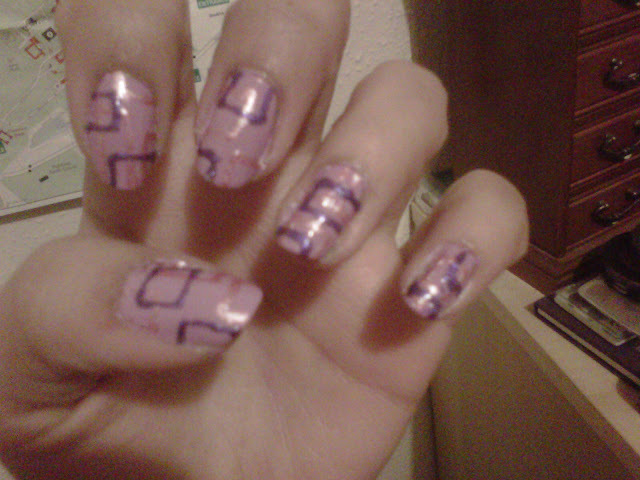 We used three different shades of purple, one for the base coat and 2 for the square outlines. This is a personal favourite, being so bright and cheerful! There's nothing cuter or girlier than bows, so I decided to use this design to finish off the colour phase of the Challenge! 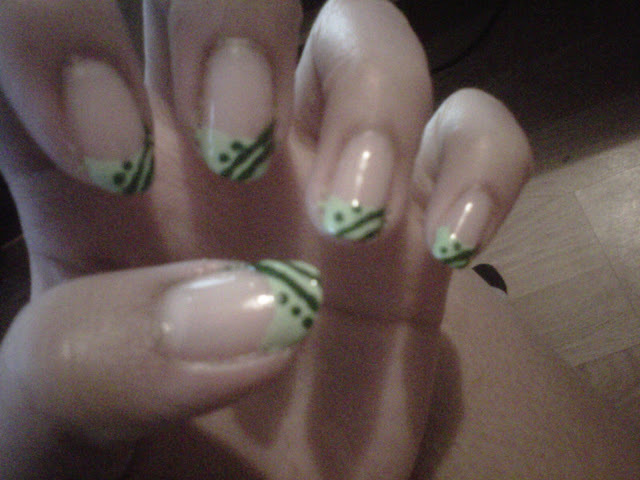 These are crazy easy, after the base coat is on, paint a small circle in the top corner of your nails. Follow this with 2 bow-looking blobs either side. Voila! Stay tuned for the next batch!